FBI Arrests Reputed Mobsters Linked To 1978 'GoodFellas' Heist : The Two-Way In a series of predawn raids, agents arrested five alleged mobsters in connection with the decades-old robbery of $5 million in cash and $1 million in jewels from a Lufthansa cargo building at JFK International airport. 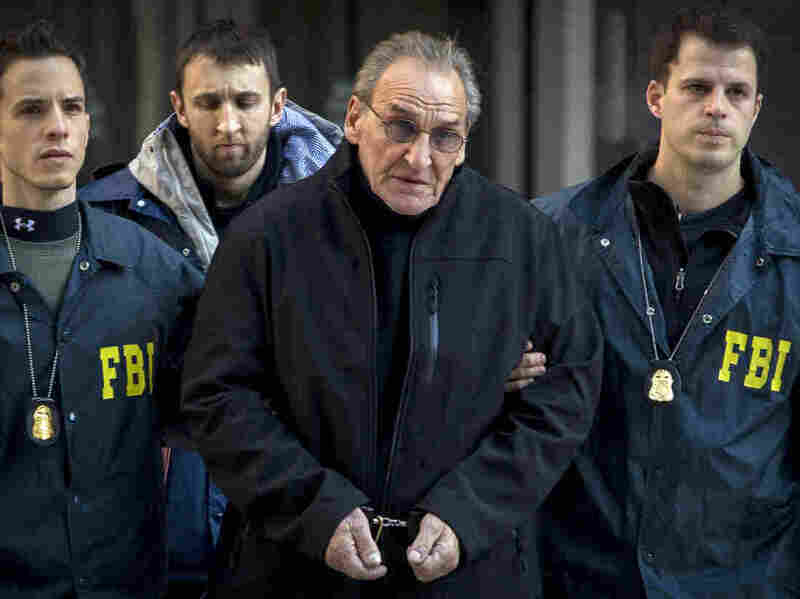 Reputed Bonanno crime family leader Vincent Asaro, 78, is escorted by FBI agents from their Manhattan offices in New York on Thursday. The FBI nabbed five alleged mobsters in a series of predawn raids in New York on Thursday in connection with the infamous 1978 Lufthansa heist that netted $6 million in cash and jewels and that inspired the film GoodFellas. Among those arrested was Vincent Asaro, 78, who is allegedly a ranking member of the Bonanno crime family. He was seized at his home in Queens, N.Y. Reputed mob underboss Thomas "Tommy D" DiFiore of Long Island, N.Y., also was taken into custody, according to ABC News. The New York Times says the indictment against the five "reads like a greatest hits collection of the Mafia: armored truck heists, murder, attempted murder, extortion and bookmaking. But the crime that garnered the most attention was the Lufthansa robbery, where a group of robbers stole about $5 million in cash and nearly $1 million in jewels from a Lufthansa cargo building [at JFK airport] in December 1978 — the largest cash robbery in the nation's history at the time." In today's dollars, the heist would be worth $20 million. ABC says it "led to a massive, years-long investigative effort that ultimately proved fruitless as wiseguys and their associates believed involved in the robbery disappeared or died at the hands of nervous crime bosses." USA Today says the robbers, "using information provided by an airport worker, stole millions of U.S. currency that was part of a monthly shipment via Lufthansa to then-West Germany where it was used in monetary exchanges serving military servicemen and tourists." "It took some half-dozen masked gunman 64 minutes to steal the packets of cash, toss them into a van and escape," the newspaper adds. "The roundup had been quietly in the works for months and stems from the FBI's surprise decision last June to search for evidence at the home of the late Mafia associate James 'Jimmy the Gent' Burke in Queens. Acting on new information from a source, agents found human remains after digging in and around the home still owned by Burke's daughter, agents said. "DNA tests matched the remains to Paul Katz, who disappeared in 1969 after Burke and his henchmen found reason to believe Katz was working with law enforcement. Investigators believe that Katz was strangled with a chain and then buried at a vacant home elsewhere in Queens, sources told ABC News. "Katz's remains were allegedly moved to Burke's basement after the mobsters got spooked by a separate probe. Burke, the inspiration for Robert DeNiro's 'Jimmy Conway' character in Goodfellas, died in 1996 while serving time for a different killing. The feds believe that Burke was the mastermind of the Lufthansa Heist and was responsible for killing off almost anyone who could directly connect him to the notorious caper."